A whole month has passed since we last posted, a month that has just flown by! We have both been so insanely busy that it's been near impossible to do all that we'd hoped. Blog, work, walk Poppy, dog training with Poppy, clean, shop.... you know the drill! It's all been a tad too hectic, so we had to take a little bit of time to let things calm before we could get back on track and back to blogging. So thanks for waiting for us! Once again we've both got so many ideas lined up in our heads. Project ideas, as well as post ideas! We are just trying to figure out when and how to share them with you all. For now though we're back with a post all about a product that we feel is not only pretty cool, extremely functional, but we're also sure that it is a product that many of you would be more than interested in....The Yarnit!!! Now, we were first introduced to the Yarnit!!! a few weeks ago by the very lovely Kate Sullivan. Kate is the very clever lady behind the Yarnit....she invented it!!! Kate told us all about her product and just hearing the name, we new that it would be something that we would love. 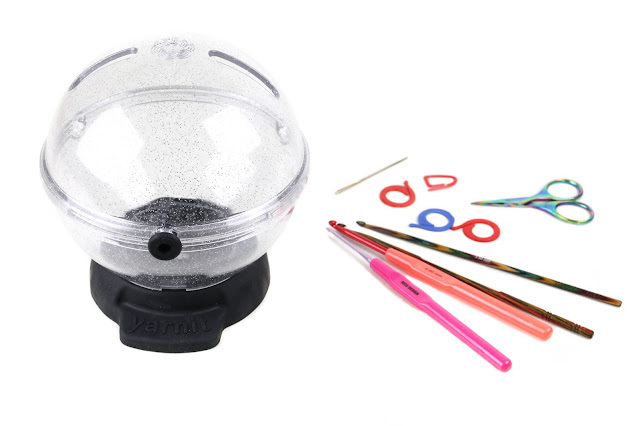 So what is the Yarnit and why do we think it's a useful crafting product? 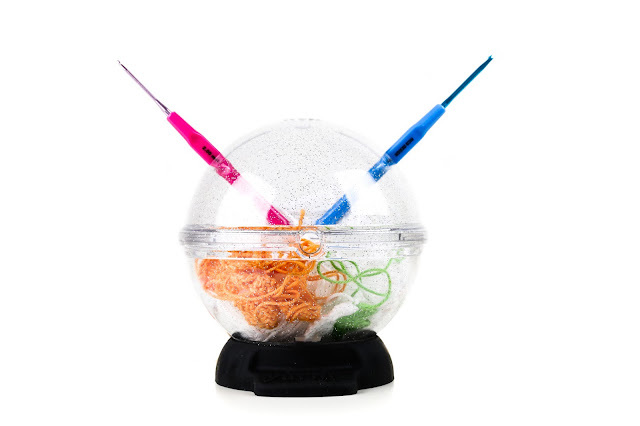 The Yarnit is a nearly indestructible globe that keeps your yarn safe and protected from dust, dirt, pets, and accidents. 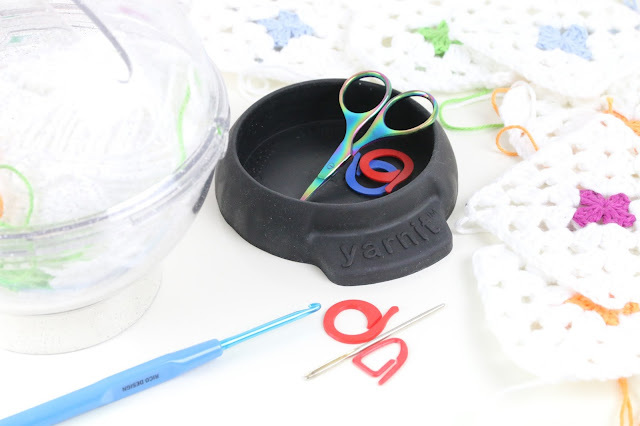 The dome shaped body of the Yarnit keeps your yarn by your side so there is no more chasing it across the floor whilst working on a project. 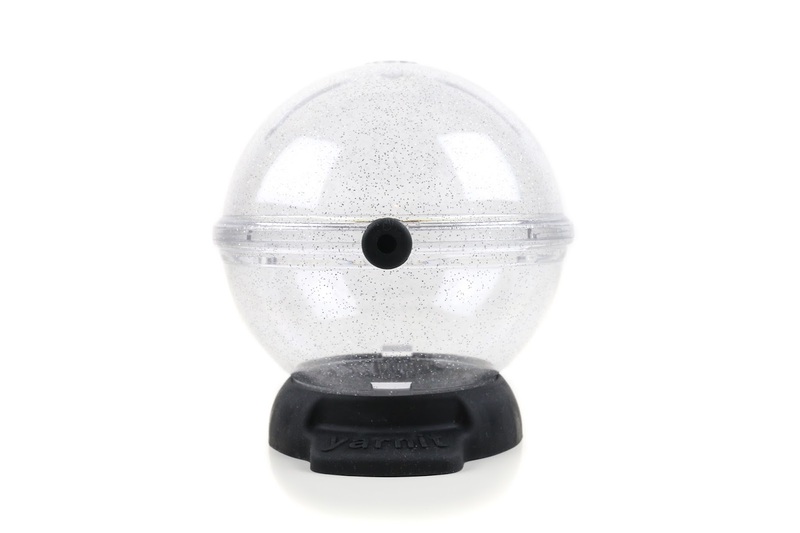 At the base of the Yarnit you will find a special rubber platform that grips securely to all surfaces and doubles up as a little storage area. 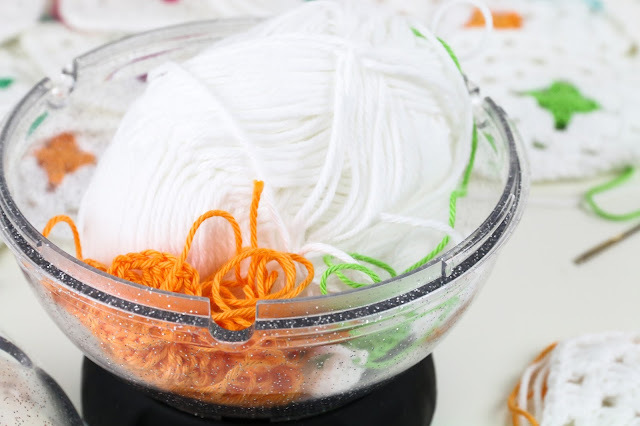 It's perfect for a small pair of scissors, stitch markers and darning needles. We like that feature a lot as we are forever losing our scissors and markers! Now this version of the Yarnit, is the original size. 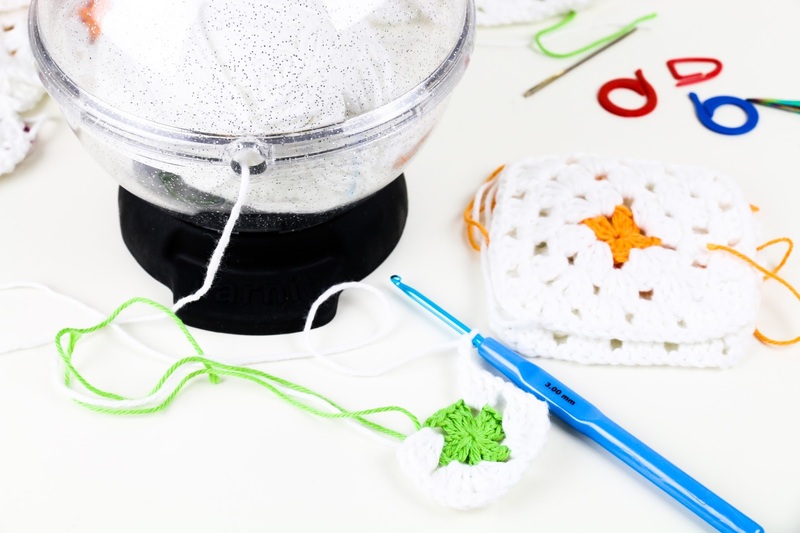 It's a great size for smaller projects to take with you on the go. 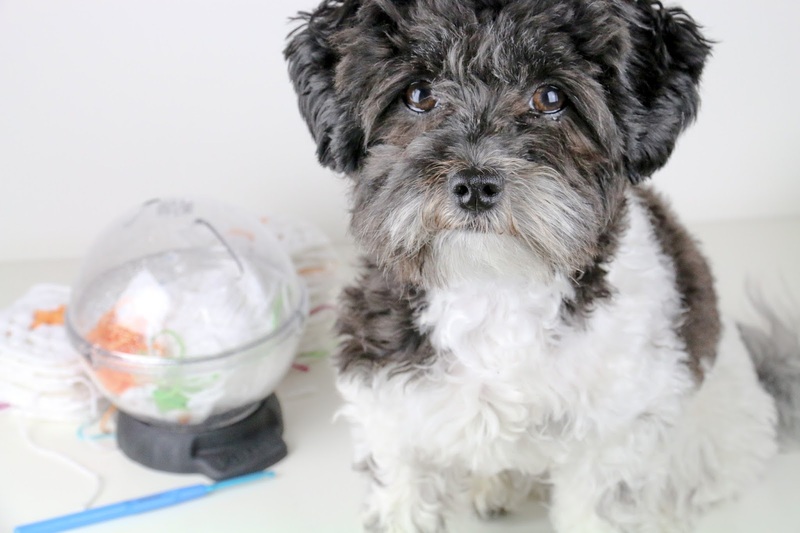 The best thing for us is that it fully protects our yarn from the ferocious mutt that we call Poppy!! She loves to chase the bouncing yarn around our feet as we're crocheting. This way we don't have to go through the battle of removing the yarn from Poppy's clutches and no longer run the risk of damaging the yarn. As you can see we are very happy with out Yarnit. It really is a fantastic product. Kate has been working on a new version of the yarnit, it's much bigger and aptly named BIG SULLY! Of course coming up with a new version, takes time and money so Kate has started a Kickstarter campaign to raise the funds in order to develop and produce her new version of the Yarnit. Needle docking slots for all needle gauges, hook sizes 2 to 17! 6" ruler included for those quick measurements! So if you like what you're seeing why not pop over to the Kickstarter page and have a look at Kate's ideas and support her campaign. We're sure that you will like what you see. Alternatively visit Kate over at her webpage, www.theyarnit.com. We love Kate's products, it's nice to see a product designed by a crafter with fellow crafters in mind. The attention to detail is obvious we give it a definite thumbs up!